In Western Germany the Landstuhl Regional Medical Center is the largest US military medical facility outside the U.S. and gives care to both US and coalition forces, as well as their families. KJZZ’s Tony Ganzer visited Landstuhl, and brings the voices of three Arizonans in the military medical system, with very different stories. TG: Staff Sergeant Joshua Valles is a combat veteran. He’s only in his late 20s but he’s served four tours of duty in combat zones, one in Kosovo and three in Afghanistan. Valles is from Tucson, and joined the Army right after high school, finding his place in the 173rd Airborne Combat Division based in Vicenza Italy. On this day he’s recovering from surgery on his leg where doctors repaired some damage, and removed a bullet, taken during a nighttime patrol shift in Afghanistan. Staff Sergeant Joshua Valles in his hospital room at Landstuhl. TG: Valles noticed a Taliban fighter trying to flank the American unit, running about 15 meters away. The surgical wing of Landstuhl Regional Medical Center. TG: The bullet shattered Valles’ femur bone, and he was rushed to Landstuhl. His buddy died. Doctors told Valles he would never run again, and the injury effectively ends his ability to serve in combat. For now he’s been transferred to a transition unit, and the military will offer him a non-combat job. Valles instead wants to go to the University of Arizona for a criminal justice degree and to try another profession. TG: Valles is single, though his parents and siblings still live in Tucson. He says life in the military is something you just get used to. He assures he’ll run again with time, though for now he gets around with crutches. Staff Sergeant Joshua Valles is recovering from surgery which repaired damage, and removed a bullet taken in Afghanistan. TG: Chief Hospital Corpsman Gabrielle Duffy is a lab technician at Landstuhl, in charge of blood and chemical testing. She’s a naval reservist who works at the Phoenix Veteran’s hospital on Indian School Road. This is her second mobilization in 5 years. Chief Duffy at her lab work station. She’s in charge of most blood testing. TG: Duffy’s family moved to Arizona from Hawaii in 1977, and she’s worked with the VA hospital for 16 years. Her mother still lives in Casa Grande, and they keep in touch with video calling. Duffy is single, and says that probably makes being abroad a little easier for her. Even still she says the experience is sometimes overwhelming. TG: Duffy hopes to go home sometime in October. Lieutenant Colonel Melissa Hale, a life long Arizonan from Mesa works in the Maternal medicine wing. She’s in charge of every aspect of maternal child nursing, and has been in the service for 20 years. Lt. Col. Melissa Hale (left) is in charge of the Maternal Medicine wing at Landstuhl. TG: Hale says people sometimees forget Landstuhl cares for people left behind, as well as wounded soldiers. She says a lot of her job is about taking care of the families of those deployed soldiers. TG: Hale, and all the Arizonans interviewed for this story were asked what people back home might be missing about the military mission abroad. Hale emphasized the consensus view. 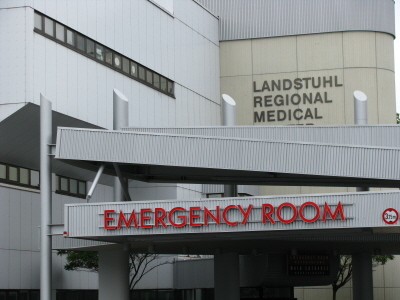 Landstuhl RMC is the largest military hospital outside the U.S. and is responsible for more than 500,000 people. TG: Hale, Duffy, and Valles all say they’re working to complete their mission what ever that may be. Hale says Landstuhl may not be the middle of a war zone, but it’s pretty darn close. For KJZZ, I’m Tony Ganzer in Landstuhl Germany.